Saddeloosas are a cross between Appaloosas and American Saddlebreds. At this time they are the initial cross but as time goes on I would like to have at least 75% ASB. 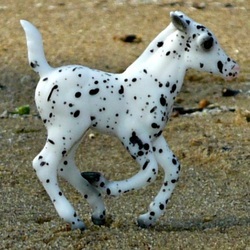 The ideal of this 'breed' is to be an ASB look with the spotting of the Appaloosa. 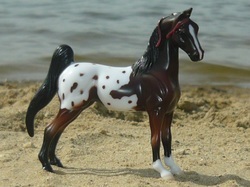 No pinto patterns (tobiano, frame overo and splash) but Sabino is allowed All colors found in the Appaloosa and ASB can be found in Saddleloosas. Roman Candle-1969 chestnut spotted blanket. Sired by Hayes Roman Cloud (r) (Appy), out of The Flaming Lady (r) (ASB). Folly's War-1965 black spotted blanket. Sired by Night of Folly (r ASB), out of Lady At War (Appaloosa). She's starting to varnish roan. Dun Deliverance-1979 red dun spotted blanket. Sired by Spring Valleys Deliverance (r ASB), out of Jailhouse (appy). Prideful Dusty Trail-1984 duanlino. Sired by Pride of Ridgefield (r ASB), out of Ima Too Dusty (Appy). Southwind Honey-2013 classic champagne leopard, rabicano and sabino. Sired by Colonial Honey (ASB), out of KSW Malakha (Araloosa/Appaloosa). Bred with the help of Legacy Farms. Delivering Pride-1983 red dun spotted blanket. Sired by Pride of Ridgefield (r ASB), out of Dun Deliverance. Windsong Supreme-1993 bay spotted blanket. Sired by Color Radiance, out of Supreme Miracle (r) (ASB). 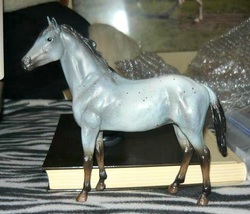 OF Breyer, SM, G3 ASB. 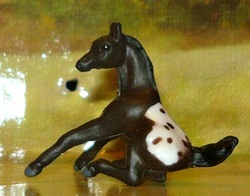 1999-All American, smoky black spotted blanket colt (x American Requiem) o/b Spur Star Ranch. Deliver Me-1997 bay spotted blanket. Sired by Spring Valleys Deliverance (r) (ASB), out of Delivering Pride. She is a breed back, her sire is also her damsire of her dam. Manipulate Me-1998 bay spotted blanket. Sired by The Manipulater (r), out of Windsong Supreme. Yep own two of these now. Will get a different pic of the other one later. Midnight Bandit-2007 black leopard. Sired by Ivory Bandit, out of Midnight Jasmine (ASB). Bred with the help of Legacy Farms.